Exalted City [H1789] - $9.00 : Yarn Tree, Your wholesale source for cross stitch supplies. Cross stitch pattern from By The Bay Needleart. 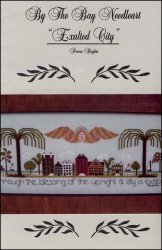 The verse "Through the blessing of the upright a city is exalted" accents a coastal town, trees, and sailboats. Stitch count 209 x 73.